“Peter…said to him, ‘Lord, you know everything; you know that I love you.’ Jesus said to him, ‘Feed my sheep’” (v. 17). The section of 1 Timothy 4 that we have studied over the past few days (vv. 6–16) defines the pastor’s responsibility as teaching the church. Of course, this passage is not the only place that focuses on the pastor’s task of preaching and teaching. Scripture has much more to say about preaching, and we will now take a break from 1 Timothy to look at the biblical view of the preacher’s task using Dr. R.C. Sproul’s series Preachers and Preaching as our guide. As we look at church history, it is evident that the greatest periods of reformation and renewal the people of God have experienced are always sparked by a renewed focus on biblical preaching. This is particularly clear when we study the Protestant Reformation. 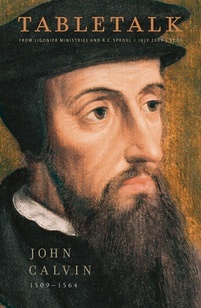 Martin Luther, John Calvin, and the other magisterial Reformers were all men who devoted their time to the preaching of God’s Word both on Sundays and throughout the week. Luther’s description of the preacher’s task will be particularly helpful to us in the days ahead. Typically, we make a distinction between preaching and teaching. The latter has more to do with the transfer of content or information, while preaching is generally characterized by exhortation and practical application. In practice, however, there is considerable overlap between the two. Good preaching must include teaching in which the application is grounded, and good teaching always carries with it an impetus toward holy living. In any case, both preaching and teaching feed the people of God. Today’s passage is the well-known restoration of Peter on the shores of Galilee after he denied the Messiah. Jesus calls Peter to nourish His flock (John 20:17), and such nourishment comes through the proclamation of biblical doctrine (2 Tim. 3:16–17). This is a basic truth, but it must be heard anew in our day since there are too many professing Christians who seem to want their pastor to be anything but a man competent in doctrine and thoroughly grounded in Scripture. Good preachers, Luther says, must “teach systematically” (Table Talk no. 397). They must know the content of the Bible and present it in a way that shows its unified portrayal of God’s plan of redemption. God’s Word is a source of nourishment for believers, the food by which we grow up into spiritual maturity. All of us, therefore, should seek out opportunities to hear Scripture taught and preached, including, but not limited to, Lord’s Day worship (primarily) and, secondarily, Bible studies, whether individually or in a group, and so on. Are you chasing after the Word of God, or are you content to attend to it merely every once in a while?